Based on the original Metamorphosis Alpha game from 1976, it has been retooled to fit into the Amazing Engine line. Publisher's blurb: "Welcome to the strange world of the Starship Warden, where sentient plants and intelligent animals share the crowded decks of a giant spaceship with mutants and primitive pure-strain humans. This is the world of Metamorphosis Alpha to Omega - a world of weird science where centaur cowboys tend intelligent cattle while keeping a sharp eye out for minotaur rustlers; a world where Amazons hunt robots and your most trusted friend could be an android in disguise; a world where mutant and pure-strain humans strive to come to terms with one another, while other new races fight to establish their own niches. All the old knowledge about how the ship's technology works, even the fact that they are aboard a spaceship at all, was lost long ago. Will your player characters survive all these challenges and be the ones to unravel the ship's many secrets and initiate Operation Exodus? 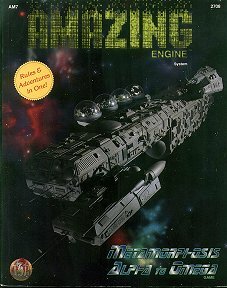 "This rulebook includes new skills, mutations, new races, high-tech weaponry and gadgets, and robots, as well as a detailed description of the ship's many ecosystems."